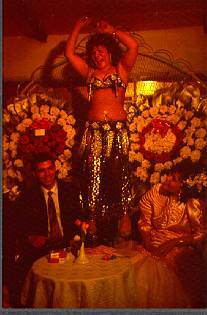 "An hour for God and an hour for the heart"
In October 1997, I returned to Cairo for a holiday, seven years after my research on female singers and dancers in Egypt was completed (see Van Nieuwkerk 1995). I immediately tried to locate my friend and favorite dancer Ibtisam, who lives in the Pyramid district. This new building area had changed a lot since I last went there. But as I visited the place so often between 1988 and 1990, I had no difficulties in tracing her house. Yet in front of her door, I began to hesitate. Where once the sign bint il balad , "daughter of the country" decorated the outside, now the presence of Sheikh Ahmed was advertized in red letters. Had she moved to another place? I asked some boys in the neighborhood about "Umm Randa" but they did not know her. "What was she doing?" they asked me. I dared not mention her profession as a dancer. So I started to name her five children and than they said: "Oh she is the mother of Sheikh Ahmed!" So they started screaming for me: "Ya Umm Ahmed," until a sleepy voice returned the yelling. It appeared that many things had changed in Ibtisam's life. She stopped working a few years ago, one of her daughters was married and had just given birth, and her eldest son had become a religious leader. She was glad to be out of the entertainment trade, she was remarried and sitting at home the whole day. When we decided to visit her daughter, she donned a scarf and said she had not be out for more than a week. We had lunch at her daughter's place - at the other extreme of the city - and watched the video of her wedding. They told me that Ahmed forbad singers and dancers to perform at his sister's wedding because it was haram, a forbidden thing in Islam. Despite his refusal Ibtisam admitted that as 'the mother of the bride' she had danced. Before I left I gave Ibtisam the Dutch version of my book since she figures in full color at the cover. She was sincerely shocked at the confrontation with her past performance. She was about to throw the book aside but could not repress a giggle and wondered: "Was that me?" This story illustrates the ambivalence that many female entertainers feel about their own professions. They feel that many Egyptians look down on them. They experience that especially women are considered immoral. They know that their work is considered haram, taboo. Why is music and dancing forbidden according to religious opinion? Why is the profession so shameful for women? How far are the religious views on entertainment internalised by performers themselves? Present day Islamic fundamentalist influence on entertainment makes an analysis of the religious discourse highly relevant. However, I should express an important reservation before answering the questions above. Although I focus on religious discourse, I am not stating that Islam is the most important force in people's lives. Religion certainly influences Egyptian attitudes toward art and entertainment, yet in spite of their strong faith, many people still maintain "an hour for God and an hour for the heart." According to most people religion does not exclude amusement, they can exist side by side. An Egyptian I interviewed remarked: "If Egyptians hear beautiful music, their first reaction of admiration is to say 'Allah!' So if we invoke the name of God, how can it be haram?"